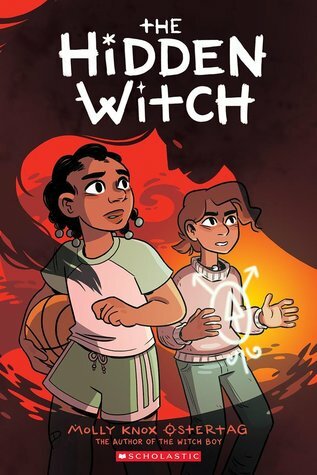 Back in January, I reviewed (and enjoyed) The Witch Boy, book 1 in Molly Knox Ostertag's new graphic novel fantasy series for middle-grade readers. Book 2, The Hidden Witch, has the same fun stories and illustrations of life in a family of witches, with relevance to real-world kids. Aster is a boy studying witchcraft with his cousins at their big home out in the country. Nearby in town, his friend, Charlie, is a regular kid who goes to regular school. She loves to play sports and is very kind, so when a new girl named Ariel starts at her school, Charlie is the first to befriend her. Ariel lives in foster care and had trouble with bullies in her last school, so her defenses are up, even with a nice girl like Charlie, because she doesn't expect to be treated well. When Charlie's not able to call her after school like she promised, Ariel assumes the worst and conjures up some dark magic to go after Charlie. Recognizing that magic is at work, Charlie runs through the woods to Aster's house, where she knows he and his family can help (they became friends in the first book). Of course, Aster wants to protect Charlie from this dark spirit, but Charlie hasn't given up on Ariel and still wants to help her and be her friend. Ostertag has created a magical fantasy world that co-exists with our real world. As in the first book of this series, the friends and family are dealing with magic and witchcraft but also real-world problems, like bullies, starting at a new school, and figuring out where you fit into the world. The theme of listening to your heart and following your dreams is continued in this novel, as well. This compelling story is illustrated with bright, engaging pictures combining our world with magic, witchcraft, and dragons. Middle-grade readers will love going along with Aster and Charlie on their adventures.